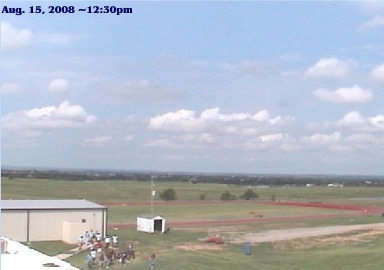 This is a snapshot from the new weather camera attached to the back of the Collinsville High School building. The direction of view and zoom can be changed. 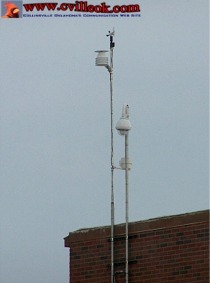 The new camera and weather monitoring devices on the north side of CHS. 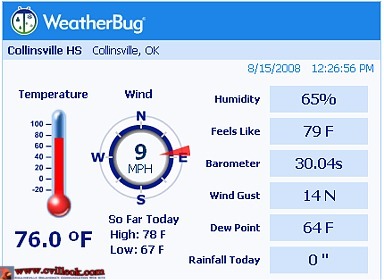 A snapshot from mid-day Friday Aug. 15, 2008 from the KJRH link below which shows the current info (like above) or the video camera current or time lapse views from Collinsville. You can also click on "cameras" in the Weather Bug current info box below or "click here". 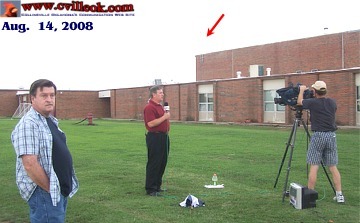 Collinsville school's technology director Larry Meece (left) watches as KJRH Meteorologist Dan Threlkeld prepared for a live broadcast from Collinsville August 14th announcing the Collinsville camera and weather reading station at CHS. Larry installed and configured the weather equipment & functionality with funds approved in the most recent school bond election to enhance the school's technology capabilities. There is an associated set of studies for students to utilize the new mini-weather station.